Danish Army Specific: Mounted with a Danish produced 20 mm machine gun M 1938. Used in this configuration to protect convoys on the move. After arrival the gun could be deployed to support infantry etc. 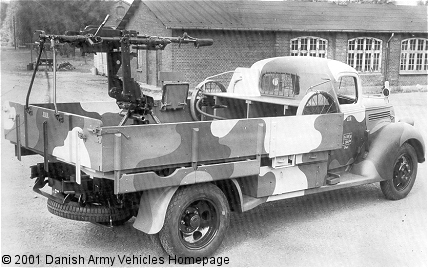 Historical: Shown vehicle is probably a model 917 T.
Additional: 450 rounds of ammunition were carried on the truck. The camouflage scheme is supposedly experimental.